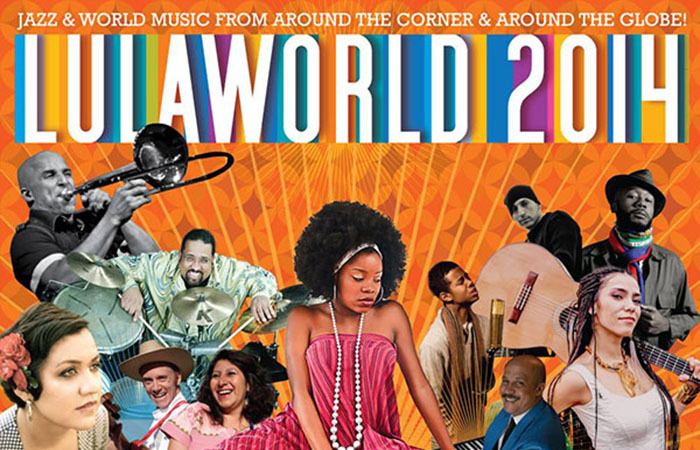 Now in its ninth year, The Lulaworld festival brings together Toronto’s finest world, jazz and Latin musicians performing alongside and collaborating with celebrated international guests. In anticipation of the Toronto 2015 PANAM games, Lulaworld will focus on artists with cultural roots in Mexico, Colombia, Cuba, Dominican Republic, Puerto Rico, Haiti, Trinidad, Guadalupe and Brazil and will also include influences from Angola, Israel, Portugal, Turkey and Italy. The 2014 Lulaworld festival will highlight the incredible breadth and calibre of the Toronto live music scene. For the very first time, the festival will conclude with a day of free outdoor programming as part of Dundas West Fest on June 7. Lulaworld is presented by Lula Music and Arts Centre with the support of the Toronto Arts Council, The Ontario Arts Council, The Government of Ontario, Canadian Heritage and Business for the Arts as well as sponsors CBC Toronto, Mill Street Brewery, Telelatino, Barocco Coffee Company, Toronto Hispano and co-presenters CIUT, Jewish Music Week in Toronto, Small World Music, Cafe Con Letras, International Brazil Fest, Nossa TV Canada, LACSN, Soul Drums, Uma Nota, Dos Mundos, Cubaintoronto.com, Latinjazznet.com, Mexicatessen, Alucine, The Music Gallery, The Dundas West BIA and Dundas West Fest. Presented in partnership with the Toronto International Brazil Fest, Cafe Con Letras and Nossa TV. Parrandera, cumbia and salsa dance party with 8pm lesson. Colombian roots and classics! Spanish Harlem Orchestra singer direct from NYC with Sean Bellaviti’s salsa ensemble. Avant-garde, soul, hip hop, electronic & jazz from NYC and Washington, DC. Direct from NYC: Colombian percussion + soul & reggae psychedelic punk & afro-beat. Zeynep Ozbilen w Roberto Linares Brown + Dj Yumaniche + Vladimir! Mexican artists from Montreal, LA and Toronto collaborate to perform Gonzalez’ work. Juno-winning veteran bassist producer + members of Gryphon Trio and Annex Quartet. Jazz players at the vanguard of their generation from NYC. Traversing everything from blues, gospel & soul to rock n’ roll, country, and rockabilly. Angolan, Portuguese & Canadian trio led by bassist for fado sensation Mariza. Two legends of the New York salsa scene join Toronto’s best to perform Bosch’s repertoire.